Shareholders Push Exxon To Disclose Business Impact Of Fighting Climate Change : The Two-Way In a victory for environmental activists, investors have passed a nonbinding proposal calling for Exxon Mobil to publicly examine how efforts to cut greenhouse gases would affect its bottom line. The Exxon Mobil shareholder vote is seen as a victory for environmental activists and one that is aimed at getting the company to consider "material risk," according to The Dallas Morning News. 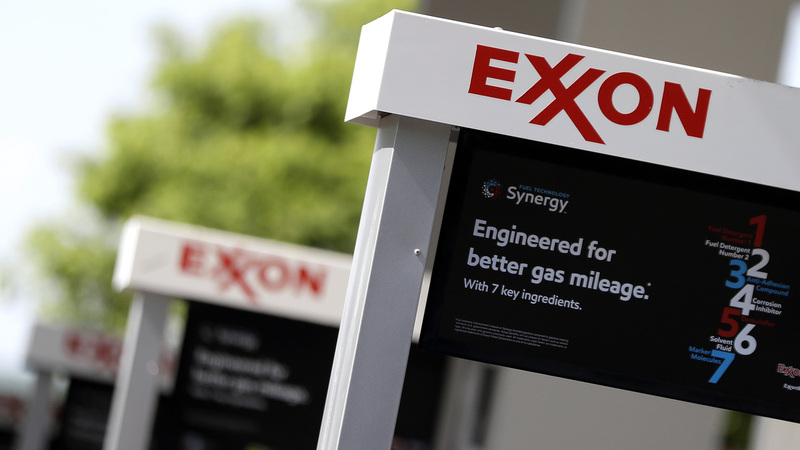 The nonbinding proposal was passed at the company's general meeting in Dallas on Wednesday, and now goes before Exxon Mobil's board. Chief executive Darren Woods said the board members would factor in the evidently strong support from shareholders, Agence France-Presse reports. The initiative was supported by more than 62 percent of shareholders who voted — a big leap from last year, when there was 38 percent support for a similar proposal, Reuters reports. As The Dallas Morning News reports, a vote that resounding indicates that major Wall Street investors are following the lead of environmental activists on this issue. The yearly reports "would include details on how the company would survive in the event that carbon-reducing policies lead to lower oil demand," Travis Bubenik of Houston Public Media reports. "Exxon Mobil supports the Paris deal — but opposed the shareholder effort, saying the company is tackling climate change in other ways." So how exactly is it a victory for environmentalists if Exxon Mobil is tallying up the economic impact of the Paris accord? "The goal is to make Exxon plan for a world where fossil fuels like oil and natural gas may be replaced by renewable energy from sunlight and wind. "[She] said some companies they've approached — including Exxon — have said they don't believe the world is going to achieve the Paris Agreement goal to limit global average temperature rise to 'well below' 2 degrees Celsius. But she said the planning and self reflection required by the proposal would help the company prepare for the eventual decline in fossil fuel demand." The newspaper notes that Irving, Texas-based Exxon Mobil is the world's largest publicly traded energy company. The vote comes as President Trump is expected to announce his decision on whether to withdraw from the Paris climate agreement. The Washington Post, citing an anonymous source, suggested that major financial firm BlackRock, and possibly Vanguard and State Street, supported the initiative, which was opposed by Exxon Mobil management. Within the past two years, evidence has emerged that oil giant was aware of the threat posed by climate change, directly caused by the use of fossil fuels, for decades before the company publicly acknowledged it. Exxon Mobil provides financial support to NPR.